Experiments answer questions like “Why do cells in different organisms function differently?” and “Why do cells in different organs function differently?”. By comparing cells of various organs, structures and organisms, students begin to understand that differences in organ or organism functions are due, in part, to the organization of cells within tissues; and in part to differences in cellular function. Also, students make connections between the structure and function of two cell structures, the membrane cell and the cell wall, within the context of osmosis. Using a microscope, observe slides using 4X, 10X, 40X, and 100X objectives. Observe specimens and consider variables that affect their observations, such as the presence and type of staining and section preparation. Realize that knowledge of staining and sectioning is important in helping to identify structures and functions of cells. Recognize that cells from different organisms may appear similar under microscopic observation. Prepare wet mount slides using cheek cells, a layer of onion cells, and an Elodea leaf. Identify the nucleus, cytoplasm, and cell membrane in stained and unstained animal cell specimens. Identify common structures of plant cells including chloroplasts, cell walls, cell membranes and nuclei. 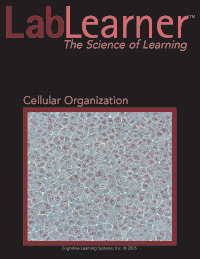 Compare structures and organization of plant cells and tissues to those of animal cells and tissues. Begin to understand that although generalizations about cellular structures of plant and animal cells can be made, all cells from the same organism may not have identical cellular structures or organelles. Prepare various concentrations of a salt solution and create wet mount slides of plant specimens placed in water and in these solutions. Observe plants cells in water and in various concentrations of a salt solution and note whether the cell walls and the cell membranes are distinguishable. Understand that the presence or absence of some cellular structures governs cellular and tissue function. Observe the cellular effects of osmosis and infer that the cell membranes of Elodea and onion are permeable to water and impermeable to salt.